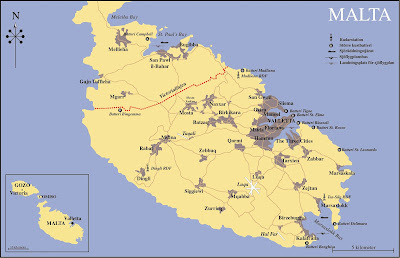 The place of Malta in the general strategy of Britain's interests determined whether it would be abandoned or defended. A dilemma arose in the 1930s from Mussolini's development of Italian colonies in North Africa and his annexation of Ethiopia. His claim that the Mediterranean Sea was Mare Nostrum ("Our Sea"), just as the Romans had done many hundreds of years earlier, threatened Britain's access to Egypt and the Near East, the Suez Canal, India and the Far East. Whilst Britain and France were allies there was some security of passage, but even in the early 1930s there were doubts in Britain about the political stability of France. An air route from Britain to Portugal, and round to the south of French North Africa and on to Khartoum was designed, and construction commenced, although there were no aircraft in production with the necessary performance. The route was initially intended for the four-engined de Havilland Dragon and various flying boats using rivers and lakes. Malta was also somewhat politically unstable in the mid-1930s. There was an influential minority who had Italian sympathies and another minority who wanted independence from Britain. After the declaration of war in September 1939, the first priority for reinforcement from Britain was the British forces in France, which ended in Dunkirk. The second priority was Norway, which was equally disastrous in its loss of men and equipment. By June 1940, when Italy joined Germany against Britain and France, its allies in the Great War, Gibraltar and Egypt also became priorities for reinforcement, while the Royal Navy was tasked to hold the Italian Fleet in the Mediterranean. Retention of Malta was initially seen to be more of a liability than an asset, but with the surrender of France, and a hostile Germany and Italy astride the direct air route from Britain to Egypt and the trans-African route still under construction, the air link between Britain and the East had been severed, so Malta had become the only possible place to refuel aircraft between Britain and Egypt. To secure Malta, it was necessary to build up its defences including fighter aircraft. But no fighter had sufficient range to fly from any British base to Malta. The decision to defend the island was a radical change of policy, requiring immediate actions. It was not a simple redeployment of existing resources. In mid-April 1939, 24 crated Sea Gladiators were despatched from Britain on board the freighter Nailsea Court, on charter to the Sea Transport Department, arriving at Malta on 30 April. Six of the fighters (N5512-5517) were then transferred to Alexandria for deployment in the Middle East, whilst the other 18 (N5518-5535) were to be assembled at Malta for use by 802 Squadron on board HMS Glorious; at this time the aircraft carrier was based at Alexandria as part of the Mediterranean Fleet. The 18 Sea Gladiators were immediately assembled at Hal Far. On 14 May, Glorious brought three Sea Gladiators (N5512, 5513 and 5517) from Alexandria and these were also assembled at Hal Far. 802 Squadron participated in an anti-invasion exercise on 19 May, during which N5534 crashed into the sea near Filfla. The remaining 20 Sea Gladiators were flown aboard Glorious on 6 June, but one of them (N5512) was transferred to HMS Eagle during August. Glorious set sail for the Indian Ocean on 9 October, to search for the German battleship Graf Spee, leaving her fighter complement behind at Alexandria, where N5528 crashed two days later. The 18 Sea Gladiators were disassembled, re-crated and taken to the French Naval base at Hyeres, where they flew training sorties during October and November 1939. Following the German blitzkrieg against Poland and the worsening situation in Northern Europe generally, the Sea Gladiators were again disassembled, recrated and taken to Malta on board the freighter Maritima, arriving on 23 December, there, they were laid-up in storage at Kalafrana. Gloriolls arrived at Malta on 17 January 1940 for a refit. In late February, while the carrier was still under overhaul, eight of the Sea Gladiators (N5518, 5521, 5525-5527, 5530, 5532 and 5533) were again assembled and were air-tested at Hal Far by pilots of 802 Squadron. Her refit completed, Glorious sailed for Alexandria on 30 March, minus her fighters, but was almost immediately recalled for service in the North Sea. On reaching the vicinity of Malta on II April, the eight Sea Gladiators of 802 Squadron were flown from Hal Far to the carrier, leaving the remaining ten in storage at Kalafrana. With war clouds looming menacingly on the Mediterranean horizon, measures were now taken to provide Hal Far with a Fighter Flight by utilising a number of the Sea Gladiators currently stored in crates at Kalafrana. Permission was forthcoming and four machines were assembled (N5519, 5520, 5524 and 5531) to form the Hal Far Fighter Flight on 19 April, together with a number of volunteer pilots under the command of Sqn Ldr A.C. 'Jock' Martin, who was the CO of RAF Luqa. Martin, who walked with a limp as a result of a bad aircraft crash some years earlier, "was getting on in years for fighter work but he insisted on flying as much as anyone else." The other pilots were FIt Lt Peter Keeble and Flg Off William Woods - the latter an Irishman inevitably known as 'Timber' - from the Hal Far Station Flight, Flg Off John Waters and Flg Off Peter Hartley, both of whom had been flying Swordfish floatplanes from Kalafrana with 3 AACU. They were soon joined by Flt Lt George Burges - a former flying boat pilot who had been based at Kalafrana but who was now ADC to the AOC, Air Vice-Marshal FH.M. Maynard AFC and Flg Off Peter Alexander, a Canadian in the RAF who had been operating radio-controlled Queen Bee target drones. At the beginning of May 1940, three of the stored fighters (N5513, 5517 and 5535) were taken to Egypt in their crates for employment on board Eagle. There now remained three Sea Gladiators (N5522, 5523 and 5529) in storage at Kalafrana. Meanwhile, the Fighter Flight at Hal Far inevitably suffered the occasional accident during its training period including a wayward landing involving Sqn Ldr Jock Martin, who hit a large wooden packing case on the side of the runway, flipping the Gladiator (N5524) onto its side; Martin was unhurt. The assembled fighters were subsequently fitted with armour plate behind the pilot's seat and with variable pitch, three-bladed propellers. At the same time the arrester hook and its fitting were removed, since it was not required, and to compensate for the increase in the aircraft's overall weight by the fitting of the armour plating. Thus, it can be seen that the Fighter Flight was no last minute panic organisation, but had been in existence and equipped for nearly two months prior to the outbreak of hostilities. Across the Sicilian Channel, some 60 miles to the north, was ranged the might of the Regia Aeronautica's 2*Squadra Aerea with almost 140 SM79bis tri-motor bombers based at Comiso, Catania, Gela, Sciacca and Castelvetrano, plus over 40 CR42 biplane fighters and 26 of the newly introduced MC200 monoplane fighters dispersed at Trapani, Palermo and Catania. In addition, there were about 50 Z501 and Z506B seaplanes for maritime reconnaissance and air-sea rescue duties based at Augusta, Syracuse, Melenas and Marsala. With such a large force available, the Italians felt more than confident that an aerial assault against Malta would pose little threat. They were abundantly aware of Malta's unpreparedness and lack of fighter defence. As recently as the evening of 9 June, the regular Sicily to Malta air service Ala Lilloria seaplane had taken off from Marsaxlokk Bay, overflying Hal Far and undoubtedly noting the availability of British aircraft on the RNAS airfield. Other frequent Italian visitors had also been using the civil aerodrome at Takali and the flying boat and seaplane bases at St Paul's Bay.